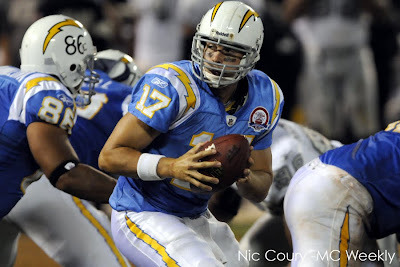 San Diego Charger's quarterback Philip Rivers (17) gets close with his offensive line. 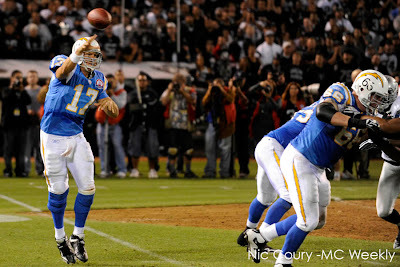 San Diego Charger's quarterback Philip Rivers (17) throws a pass. I had an opportunity of a lifetime last night to shoot an NFL game. 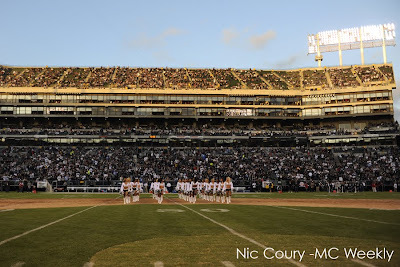 It was the season opener for the Oakland Raiders and San Diego Chargers at the Oakland Coliseum. I made the accommodations after our deputy editor Mark Anderson wrote a story about San Diego Chargers defensive coordinator Ron Rivera who played and coached for Seaside High School, then went to play for the 1985 Chicago Bears where he earned a Super Bowl ring. Needless to say, shooting professional football was mind blowing (and hard on the knees...). The energy of the fans in the stands easily matched that of the action on the field. 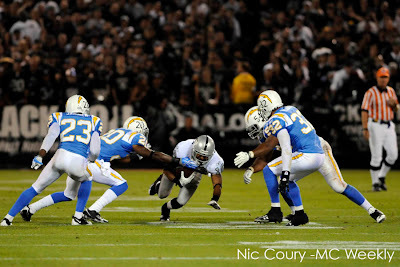 The San Diego Charger's defense gangs up on an Oakland ball carrier. 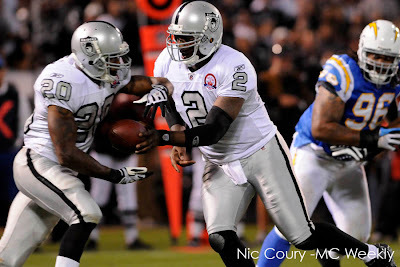 Oakland Raider's quarterback JaMarcus Russell (2) hands the ball to running back Darren McFadden (20). 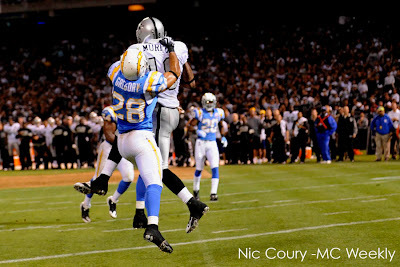 San Diego Charger's Steve Gregory (28) attempts to hold down Oakland Raider's wide receiver Louis Murphy (18) as he caught a touchdown pass. Referees called he wasn't in possession long enough. The Raider's scored a field goal on the next play. 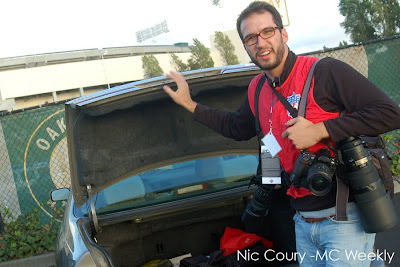 Me all geared up (note: red NFL photo vest) at my car prior to the game. Nikon D700 with either a 28-70 f/2.8 or a 70-200 f/2.8 for "shooting wide(r)" and a cropped-body Nikon D300 that had a 300 f/2.8 sometimes with a 1.4 teleconverter. 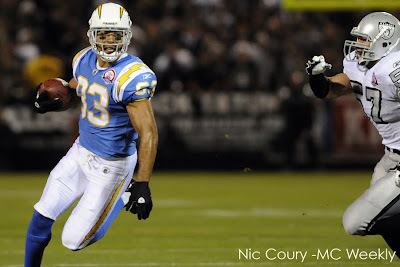 Most of my photos were shot tight and 70mm on a full-frame body is fairly wide when shooting football. I never took my wide-angle out during the actual field action. This is the first thing I saw when I entered the field from the press elevator. It was wild. Screaming fans and photographers all over the place. You never really know how big sports stadiums really are until you see them from the field level. A lot of history on that Oakland field where the Raiders and A's have both played some pretty incredible games. 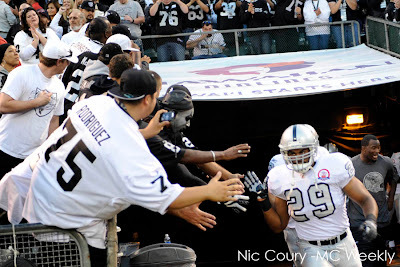 Oakland Raider's running back Michael Bush (29) high-fives a fan as he runs out to the field. 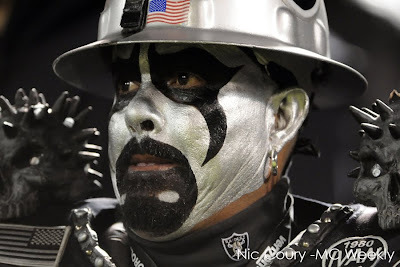 Oakland fans are some intense folks. 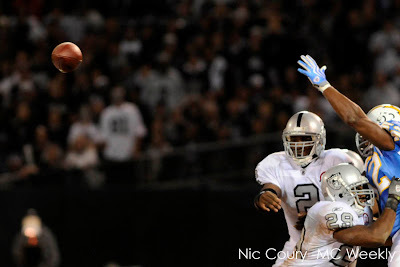 Oakland Raider's quarterback JaMarcus Russell launches a pass. 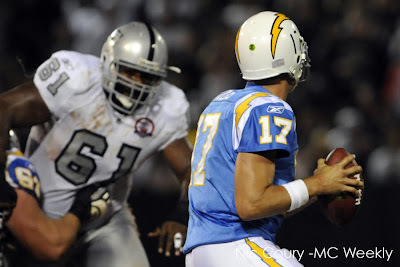 Oakland Raider's defensive tackle Gerard Warren (61) pressures San Diego Charger's quarterback Philip Rivers (17). 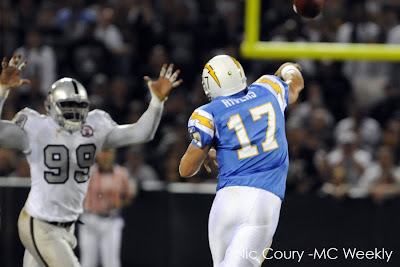 Rivers launches a pass to a receiver. 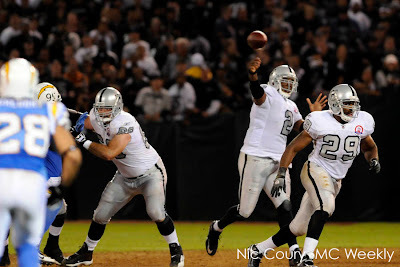 Oakland Raider's quarterback JaMarcus Russell throws. 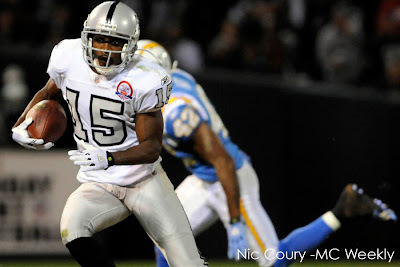 Oakland Raider's wide receiver Johnnie Lee Higgins (15) runs the ball down field. 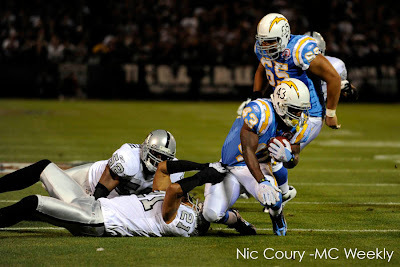 San Diego Charger's wide receiver Vincent Jackson runs out of the way of the oncoming Oakland Raider's linebacker Ricky Brown (57). 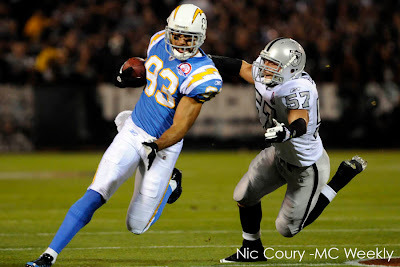 Oakland Raider's cornerback Nnamdi Asomugha (21) grabs the jersey of San Diego Charger's running back Darren Sproles (43) for the tackle. 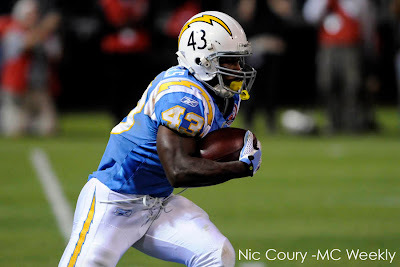 San Diego Charger's running back Darren Sproles (43) runs the ball downfield. 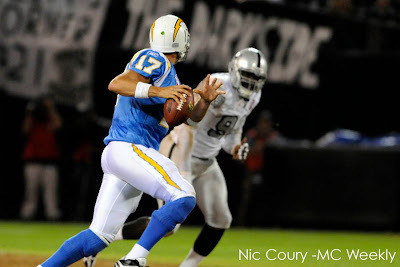 San Diego Charger's quarterback Philip Rivers (17) dodges Oakland Raider's defensive end Jay Richardson (98). 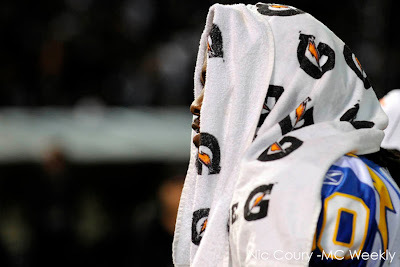 A San Diego Charger leaves the field at halftime. 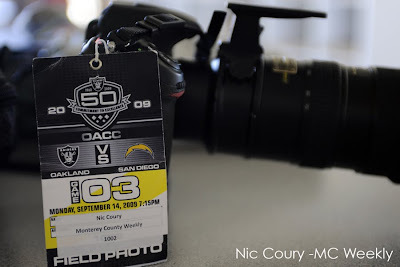 My NFL field photo press credential in front of one of my cameras on my office desk. Hopefully I'll get another chance to shoot the NFL. That was fun.